Whew. It has been a full Saturday. 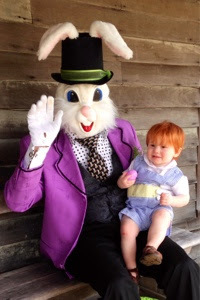 More pictures and stories to come, but because it is what I have on my phone and have no energy for uploading from the DSLR tonight, here are some pictures from our highly entertaining run in with the Easter bunny today. 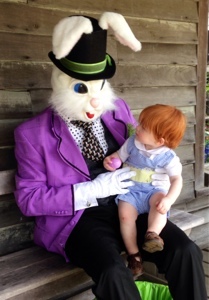 Full disclaimer, I think most Easter bunnies are super creepy...and wasn't sure I even wanted to broach the issue with P. We saw another little boy at burritt today who shares my opinion, based on his tears and screams. But Burritt's bunny was actually pretty cute, and looked quite dapper in his coat and top hat. Perry LOVED the bunny. Couldn't get enough of him. Kept going back to meet him again and again until we finally carried him away. Thankfully it was not crowded at all and the bunny seemed to like the attention too. 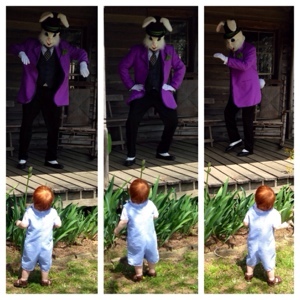 He gave P eggs and tried to teach him to hop and dance around. Thanks Burritt Bunny for being so cool!